It was a very anticlimactic end to one of the most anticipated contests in recent local MMA memory in Saturday night’s Jackson’s MMA Series XVII main event. A crowd of about 1,500 was on-hand at Buffalo Thunder Resort and Casino in the Pueblo of Pojoaque, mainly due to see if Jordan Espinosa could put action to the social media jabs he delivered in the weeks leading up to his main event bout against Nick Urso. The contest started with both men immediately meeting at the center of the cage. A front-kick from Urso (8-2) to the gut of Espinosa (7-4) sent the Albuquerque-raised fighter to the ground in a sitting position of which he quickly rose up from. 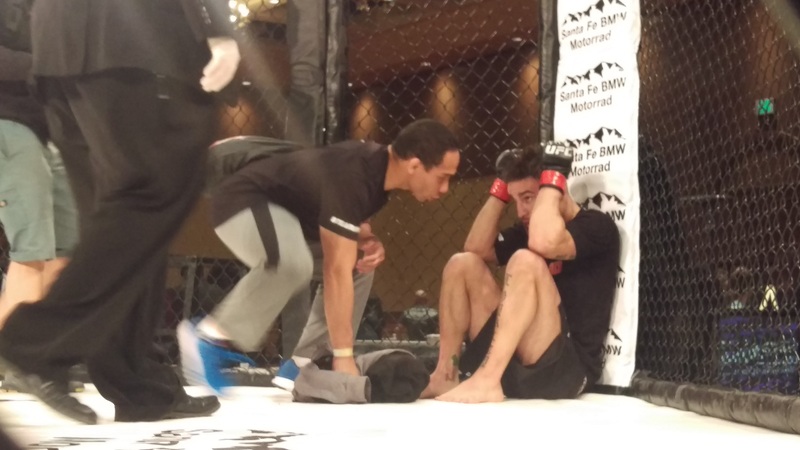 Nick Urso sits in a state bewilderment as his lead cornerman for evening, John Dodson, consoles him. Espinosa, possibly looking to immediately make amends for the kick, attempted a telegraphed flying knee. Urso used the leisurely advance as his chance to deliver an impressive takedown, catching Espinosa in mid-air and driving him to the ground. Working from the guard Urso, would land short punches that Espinosa would do his best to respond to. After a brief stalemate, the referee would ask the men to stand. Urso would immediately attack Espinosa who in turn would time him beautifully with a straight left hand that floored the Jackson’s-Wink MMA fighter. This drew a large reaction from the crowd. Recognizing the golden opportunity Luttrell-Yee MMA’s Espinosa would attempt to implement a D’arce Choke that he is widely known for in training. The unsuccessful attempt would lead to a tussle where Urso would be a recipient of a low blow. When the action resumed, Espinosa earned a takedown and scored in the ground and pound with a pair of hard punches to Urso’s head to end the round. Espinosa would be greeted by an elated corner. The crowd’s energy ushered in the second stanza. Incredibly, Espinosa would again attempt a flying-knee. Urso, who was working from a southpaw stance, would once again snag Espinosa in mid-flight, slamming him harder to the ground then he did the first time. Urso would once again take advantage, this time landing sharp elbows from the half-guard position. In an attempt to desperately scrabble and sweep out of bottom position, Espinosa would give up his back. Urso would deliver big shots to the side of Espinosa’s head. He would continue the pressure and flatten Espinosa out in the next series of blows. One of the shots momentarily saw Espinosa nod off as though for an instant his entire body shut down. At this moment the referee jumped in. It was unsure to everyone in attendance whether he was stopping the fight to award Urso a technical knockout victory or calling a time out. After signaling for the ringside physician it was obvious that the official felt one of the punches was an illegal shot to the back of the head. The blow would cost Urso a point. In shock, Urso held out his arms out wide in disbelief. Meanwhile, the doctor would tend to Espinosa. Shining a light to his eyes and performing a quick sight test, the doctor, alternated between holding up one and two fingers asking Espinosa to confirm the number of fingers he was holding up. After what felt like an eternal three-minute delay, the doctor explained to the referee that Espinosa was not fit to continue. The referee would officially waive the bout off rendering the official result of a no-contest. For Espinosa, another fight against Urso would help him get over what he feel was not one of his best performances. For a recap of every fight please check out our play-by-play coverage from last night by CLICKING HERE.